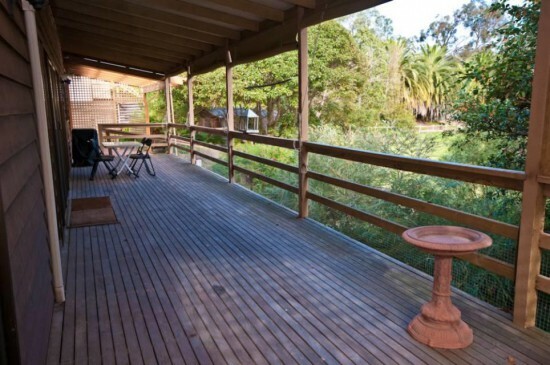 This holiday home has a large grassed yard leading to the water's edge. A covered carport with a table tennis table is included. Ample space at the house for multiple car and trailer parking is available. Eastwind on Chinamans Creek has an open plan living/dining/kitchen area with an expansive deck that has barbecue facilities. The property is framed by trees, which are home to many diverse species of birds. The kitchen in this 4-bedroom house comes equipped with a microwave, stove top, oven, dishwasher and a refrigerator. There are 2 bathrooms, a flat-screen TV, DVD player and laundry facilities, including a washing machine and a tumble dryer. The main living area of the house is heated/cooled by the split system air conditioner as well as a combustion fireplace. For guests bringing their boat, there is a boat launching ramp at Shaving Point, 3.5 km from the property. In Metung Village, 3 km away, you will find a range of shops and cafes. The unit is 20 km from Bairnsdale.